1. Preheat oven to 200C/180C fan-forced. 2. Heat 2 teaspoons oil in 5cm-deep, 26cm (base) ovenproof frying pan over medium-high heat. Cook chicken for 5 minutes each side or until well browned. Drain all but 1 tablespoon oil from pan. Transfer to oven. Bake for 15 minutes or until chicken is almost cooked through. 3. Combine rice, seasoning, paste, stock and courgette (zucchini) in a bowl. Remove chicken from pan. Add rice mixture. Return chicken to pan, nestling chicken into rice mixture. Top with beans. 4. Cover with foil. 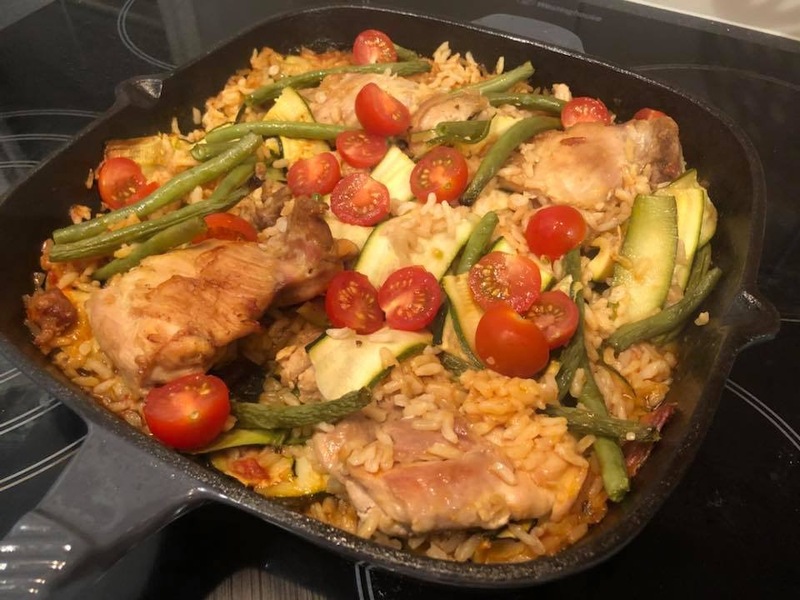 Bake for 15 minutes or until chicken is cooked through and rice is tender. Stand for 5 minutes. 5. Sprinkle rice mixture with tomato and coriander. Top with sour cream, avocado and chilli if using. Serve with lime wedges.